If you’re a new owner of the HTC One S and you’re suffering from a battery drain issue caused by Wi-Fi calling, good news — a software fix is incoming. T-Mobile’s support documents confirm the issue as of April 20th, a full 5 days before release so we hope that any update is prioritized and issued quickly to rectify the problem as the One S only being on the shelf for 4 days. There is no question that Wi-Fi calling is a big bonus for T-Mobile customers and we have no doubt they’ll work fast to rectify this issue. Are you having any problems with your battery on the One S in conjunction with Wi-Fi calling? Let us know. I’m having issues with my phone shutting off when the battery meter is low but not dead.The indicator will be yellow and still shut off. When I power it back on and plug it in, its completely dead . Did you charge the phone fully when you first received it without powering on? (Should take around 4-6 hours at a minimum)? that doesnt matter on any phone thats been built in the last 3 years. Unless, of course, you know anything about the OneS battery and how it works. HTC recommends a FULL CHARGE before use. unless of course you know about how li-ion batteries work. Wifi Calling causes mild battery drain in my Vibrant. The process (com.android.kineto) is always running in the foreground, and can’t be killed (I believe I would need to root). Just another one of the many reasons I decided to leave my cat hair refurb vibrant stock. I figured since the second go around I got one with the gps working I could live with the lag disconnects & rebooting. I didnt realize that T-Mobile TV app which is free on T-Mobile phones, and Pandora and other crap (all free) are worth $150… T-Mobile is weird. Im glad I left them. Just got my update will let you know how it goes. I have to use WiFi calling a majority of the time, haven’t been impressed with my battery life before the update, but its not any worse then my g2, which is about 10-16 hours with decent usage. We regret to inform you that we have identified a software bug with the Wifi Calling feature that causes your battery to drain. We’ve got better things to do. We’ve already got your money, and sales continue to be high, as the vast majority of our customers are unaware of this problem and our salespeople have been instructed not to disclose it to customers. For those that do discover this problem, we’re counting on the fact that you will not attempt to return the phone until it’s too late for you to do so because you reasonably expect us to address this issue with an update. We’ve got you locked into a contract with a high early termination fee so you’re kinda left with no reasonable options to rectify this. Software updates cost money, and we just don’t want to spend it. By the time this becomes a more public issue, the public’s attention will have already turned to the next big phone release, the Samsung Galaxy S3. Look at the frenzy that’s already built up! By the time the S3 is released, we will have already reached most of our sales goals for the One S, so that pretty much ensures there won’t be an update. The software problems that people will eventually discover with the S3 will start this whole cycle all over, and they won’t get an update either. You can read more on this whole process by reviewing our new policy entitled, “We’ve Already Got Your Money, And We Don’t Care!” at t-mobile dot com/hahahawegotyou. They’ll update this ASAP. The One S is currently their premier phone! Bad press won’t be good. One feature I’m really loving is the ‘SkyDrive for HTC Sense’. They don’t talk much about it…but its an OFFICIAL Android app for SkyDrive from HTC! Love the FREE storage option. You mean how they updated the G2X right away? 3 months later? I remembered when I was beta testing t-mobile’s upcoming service and devices, they were using centercode. It’s sad to see this “beta tester” experience that companies are putting us through. Just Tragic. Hasn’t even been a week yet and bugs are already found. It’s the same way with every single Android phone that comes out. The Mytouch 4G, Vibrant, Sensation, etc. all had issues at the beginning. Yes but will it fix the constant rebooting and random signal loss? Mine is going back. This is exactly why I made the decision long ago not to buy a smartphone immediately after it’s released. Not downing those who have, but it’s a personal choice for me. I’ve been burned like this too often. It’s like the first batch is a “public beta”. I still don’t see how things like this get past testing. All they would have to do is connect to wifi and actually USE the feature in a normal environment…right? Gman, how did you get the update already? I don’t think it came out yet. This mindset is exactly why android isn’t completely dominating the market, and why apple continues to prevail. Sad. iPhone has issues as well, what’s make you think they don’t? Remember when they were offering free cases so people wouldn’t hold the phone and lose signal? That’s a hardware issue that can’t be fixed without a new phone so at least there are software issues with Android that can be addressed. The iphone, and IOS in general has far fewer issues than android. After owning both systems, while I like the flexibility and compatibility of android, it’s a very unstable OS that is prone to software bugs, lag and crashes… and that’s in addition to the fragmentation accross devices and the lack of timely updates. IOS on the other hand, is a very closed system and cannot do simple things like play AVIs or be used in mass storage mode, but it’s smooth as silk, updates all at once, and is extremely stable. I don’t ever remember my ipad crashing. Ok, then stick with ios. I don’t get why you are posting on a thread that’s for an android phone, when you are not using android? Or if you are using an android phone, how come? You prefer ios, right? Different devices for different purposes. I don’t need to prefer either device as I have uses for both, and both have their positives are negatives. I can openly critique either. Don’t be so narrow minded. Not being morrow minded, you said openly “critique either” but all you have done on this post is state how great IOS is and how bad Android is, where is your critique of IOS? We can only go by why you write here, if you only defend IOS and put Android down on your posts, then that will be what people think you are all about. Who said I needed to point out every single thing that I think is wrong with IOS? Why don’t you do it for me and save me the trouble? Nah, you seem to be very good at it. Lets just agree to disagree. So then you’re saying we can compare apple to google since they have a manufacturer make a nexus device to their specs every year? That is not what he said at all, dear god Anonymous, go play at the Apple forums…. No Thanks, I’ll stay here. He stated that we cannot compared htc to apple or other manufacturers because apples makes their software (OS) and controls their hardware… Well so does google.. for the nexus phones. So his argument is flawed and I was just stating so. No my argument is not flawed, once again you are wrong. Google does not make the nexus hardware at all so you still cant compare. When you have an issue with your nexus phones you don’t call Google for support, you would call HTC or Samsung depending on which device you have. lol. So please before you try to correct someone get your facts straight. This mindset is exactly why apple isn’t completely dominating the market, and why android continues to prevail. Yes, I can easily turn this argument right back at you. Apple’s forum is flooded with complaints about terrible battery life on the iPhone 4S. Go take a look for yourself if you don’t believe me. People living in glass houses shouldn’t throw stones. Sad. Yet it is the top selling handset on every carrier in the US that has it, and is a sizable chunk of unlocked phones on tmobile. but but but the battery issues! no one cares. Last I checked this article was about battery drain. It’s downright hypocritical to cite the One S’s battery issues as an example of how the iPhone is superior when the iPhone 4S has serious battery issues too. And judging by all the posts on the subject over at Apple’s forums, despite your hypocritical attempt to dismiss the issue, lots of iPhone owners do care. Now if you want to change the subject to sales comparisons, it’s pretty obvious to anyone who reads the news that Android smartphones outsell iOS smartphones overall and that Samsung outsells Apple. It doesn’t really matter if Apple has the single most popular model since Apple only releases a single new model each year. If you want a bigger screen,a different look, or a removable battery you’re out of luck. So there are no other new iPhone’s to split the iPhone customer base the way there are with android phones. I want my $100 credit!!!!! Wait…wrong phone manufacturer…..
lol that’s a joke but why they hold ics for htc sensation 4G but tmobile are too stupid to go ahead roll new htc s one fone out but they still have software issues it dont make sense???? why they hold htc sensation 4g ics update back????? NO EXCUSE!!!!!!!!!!! Make no different!!!!!!! wow, you make no sense and sound completely ignorant. I don’t even know what you’re trying to say but it sure sounds stupid. 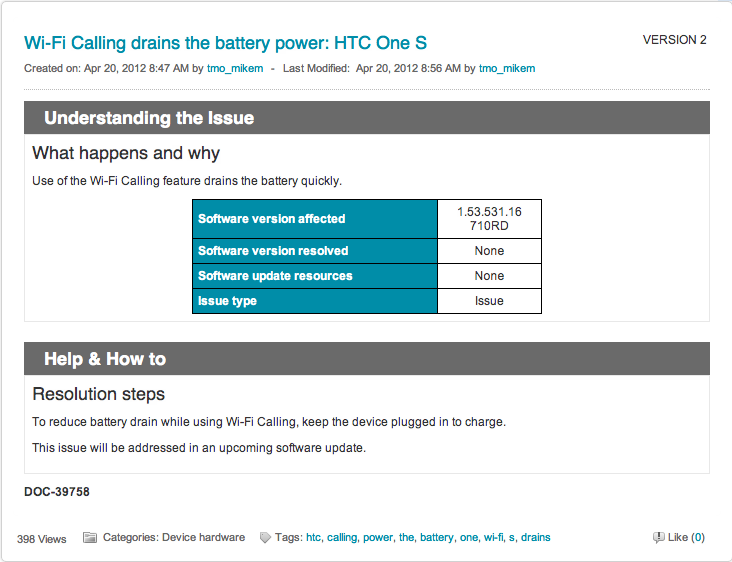 HTC One S already suffer from software choking…. wait a moment let me take breath Darn this crap crack me up!!!!! darn Tmobile must be one of best joker! SMH! LOL!!!! My Sensation has the same problem. Im getting the global edition! Fix to “Nokia Lumia Battery Draining”..